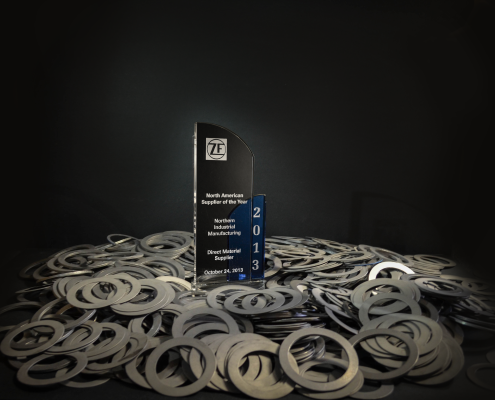 ZF Awards Four Companies with “Supplier of the Year” Honors. ZF hosted its “Supplier Day” Conference in Novi, Michigan, Oct 23-24. MSC, Northern Industrial Manufacturing, Serviacero Worthington and Seymour Tubing were each honored as a North American “Supplier of the Year”. Serviacero will go on to compete for “Global Supplier of the Year Award” for ZF. NORTHVILLE, Mich. — ZF invited its top 100 production suppliers to its 2013 “ZF Supplier Day Conference”, which took place in Novi, Mich., from Oct. 23-24. Four regional suppliers, MSC, Northern Industrial Manufacturing, Serviacero Worthington and Seymour Tubing, were presented with a “Supplier of the Year” Award at the conference’s closing ceremony. On Oct. 24, ZF Supplier Day brought together the company’s top production suppliers for a day of networking and presentations from ZF’s leadership and purchasing executives. The day, which featured overviews about the company’s reorganization, as well as processes, strategies and initiatives that are critical to ZF and its suppliers, ended with an awards ceremony. At the event, ZF recognized four of its top North American suppliers: MSC, Northern Industrial Manufacturing, Seymour Tubing and Serviacero Worthington. MSC was the winner in the Indirect Materials category, while the other three suppliers were honored for their excellence in Production Materials. MSC supplies ZF with tools, safety materials and spare parts; among other reasons, it received the award for constantly providing cost-saving ideas to ZF locations nationwide. Michigan-based manufacturer of precision-thrust components, Northern Industrial Manufacturing, was praised for actively suggesting improvements in the manufacturing process, which resulted in quality, delivery and price benefits. Serviacero Worthington is one of the largest distributors and processors of steel in Mexico, and has become a valuable provider of steel coil processing for ZF in North America. The steel manufacturer, which supplies to ZF’s locations in Saltillo and Guadalajara, was awarded for its consistent efforts in increasing competitiveness while also openly sharing economic benefits of new investments at their plants with ZF. Seymour Tubing is one of the most important steel and tube manufacturers worldwide, supplying ZF with steel tubes primarily for structural components; the company was honored for its strong commitment to continuous improvement. A jury of ZF executives, from purchasing, logistics, quality and technology, selected the honorees based on a wide array of performance-based categories. Of the four winners, Serviacero Worthington was voted to represent North America for ZF’s Global Supplier of the Year Award, which will be held in Friedrichshafen, Germany, on Nov. 26, 2013. ZF is a global leader in driveline and chassis technology with 121 production companies in 26 countries. In 2012, the company achieved a sales figure of about EUR 17.4 billion with approximately 75,000 employees. In order to continue to be successful with innovative products, ZF annually invests about five percent of its sales (2012: EUR 861 million) in research and development. ZF is one of the 10 largest automotive suppliers worldwide.